If I could only keep one repair manual, this is the one I’d keep. As King Solomon said, “With all your getting, get understanding.” This is the difference between Romney and Tomosy. Tomosy explains “a camera”, Romney explains “all cameras”, unknowing step by step versus theory. Still Tomosy’s books are more professionally done and much better illustrated. If these two men could get together they’d make one Hell of a book! The scope of “Basic Training” encompasses nearly the whole of Tomosy’s first four books. Romney calls his approach the “system method” because he goes into the component mechanisms that comprise all cameras. So much for comparing, on to describing this book. In the introduction Romney begins teaching. He mentions troubleshooting hints at the outset, how to tell a well used camera from one that has been on a shelf, which cameras to look for and which to look out for, etc. In Section 1 (chapter 1?) the required tools are listed as well as makeshift tools that can be made. In Section 2 he jumps right into how to take a camera apart, getting your feet wet fast! Section 3 leaf shutters and the differences between designs, Compur, Seikosha, Prontor, etc. Section 4, focal plane shutters: Exakta-like pin and hole, cloth curtain, Copal Square, etc. Section 5 goes into adjusting shutters while Section 6 is adjusting focus systems. Section 7 & 8 describes wind mechanisms of 35mm and roll film. Section 9 does meters, both built-in and hand held. Section 10 looks at SLR’s as a whole. Section 11 describes lubrication. Section 12 talks about rangefinder and viewfinder cameras. 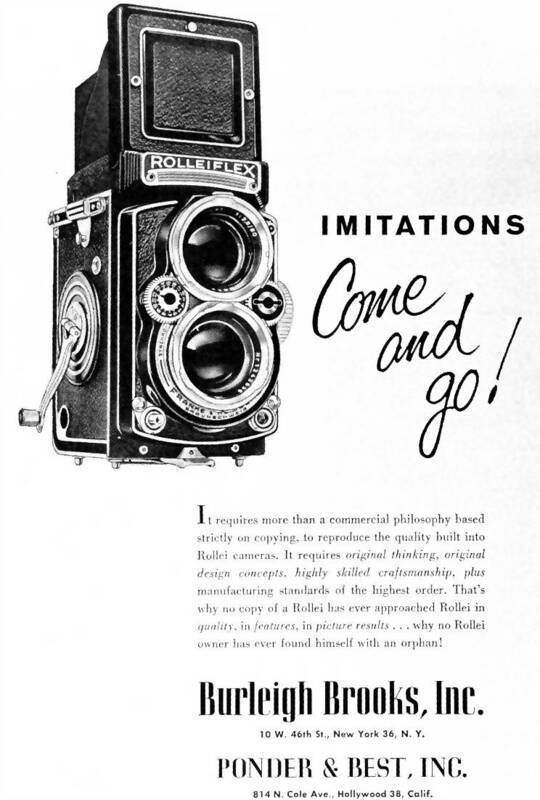 Section 13 is devoted to TLR’s while Section 14 is on Large Format. Sections 15, 16 and 17 lightly touches on electronic cameras. (My experience agrees with Romney when he says service manuals are necessary when troubleshooting electronic cameras.) Section 18, synch and strobe. Section 19, lenses and diaphragms. Section 20 and 21 goes into bellows and wood frame cameras. This book is short on pictures, its biggest failing. The quality of the pictures and diagrams is its second biggest. The inserted, folded plate pictures (supposedly meant to pin to the wall?) are clumsy to use and probably will get lost and separated from the book. Getting back to comparing Romney and Tomosy books, buy Tomosy if you only plan on working on one or two cameras that happen to be covered in his books. Buy Romney if you want to understand how to work on many different cameras. Or be like me and buy all of them so you can gripe a bunch about both authors and their methods! If one is a complete novice at camera repair (or tinkering as I prefer to call it), this is the book to read. Not because it is the best but rather because it is the simplest. Most would be tinkerers quit after the first camera either because they only intend on fixing their beloved old camera the local shop will no longer touch or because their first effort ended up in a baggie. So simple here is good. Section 1 (of 3) starts out with a description of the tools and materials required, then chapters 3 & 4 moves into common sense precautions and Do’s and Don’ts. In chapter five the study of theory begins as Tomosy gives excellent flowcharts of operating sequences of the various types of cameras: Rangefinder, SLR, etc. Chapters 6, 7 & 8 is spent on cleaning. If you are still awake after these three, chapters 9 & 10 describe some common problems and their solutions…finally. Chapter 11 & 12 present basic troubleshooting. One of my favorite chapters was number 13 where there is descriptions of simple test equipment one can make. Chapter 14 goes into the tinkerers biggest nightmare, finding parts. Section 2, things finally start to get interesting as he uses representative cameras to show some basic design layouts. Mechanical SLR, Electronic SLR, P&S’s, mechanical rangefinders, etc. These are well worth studying then coming back to often in the first few weeks of screw turning. I cannot praise this section enough but can complain that it isn’t thorough or complete enough. Tomosy explains the sample cameras well and “nearly” has enough pictures.. Section 3 is similar to Section 2 only many more cameras and very little information on each, kind of an anorexic Section 2. The Appendix’s give ok reference data. Nothing to brag about. Read them if the cleaning chapters didn’t do you in. All in all, Book 1 is a good book but too short for such a huge subject. One would have hoped that Book 2 would have gone deeper into camera design/manufacturing theory so a well grounded understanding of camera functions could have been gleaned, and the aspiring technician (tinkerer) made able to diagnose any camera. No such luck. Instead Book 2 is an expansion of Book 1. Even still in the same three section format. Imagine Book 2 as a stack of updated insert pages that would have been stuck into Book 1 had it been loose leaf. I’m not saying Book 2 is bad, just that it doesn’t build on Book 1. It only expands it, like a Russian novel, more pages …. Not much new to learn, just more examples. Still the expanded list of cameras makes for a good reference. I would have been happy if both books were condensed into one at the price of a little more than either. It seems that with every Tomosy book I buy, it gets smaller and the price gets higher. This is his third book. Finally he breaks with the 3 section format and jumps right in with practical restoring information and techniques. In my opinion this is his best done (if smallest) book so far, although it is not able to stand alone, if one is a novice. The thing I liked the most was the diagrams with dimensions…practical info. He needed to add more though. Even with my own personal short experience, I have many more dimensioned drawings of curtains, curtain ribbons, etc than he gives. I’m certain he has volumes more locked away. Sharing a few more would have been nice. As always Tomosy is short on explaining the “why” of things but good at “do this, then do that”. This book deals more with wood and bellows cameras than metal ones…say pre WWll. After the short introduction , Chapter 1 goes into the leatherwork of straps and cases. Chapter 2 is a fairly thorough introduction to bellows repair and making. Chapter 3 shows rebuilding a wooden camera stand. Chapter 4 introduces various lens shutters. Chapter 5 covers medium format and small plate folding cameras while chapter 6 delves into wooden view cameras. Chapter 7 is large format focal plane shutters. Chapter 8 gives a bit more on medium format and one TLR. Chapter 9 gets into the classic 35mm metal bodied cameras like Contax, Exakta and Leica, etc. This is a super chapter. Chapter 10, miniature format ie. Minox C. Tomosy wraps it up with an abstract where he reiterates stuff from his first two books. Many classic cameras are covered, none of which were in his previous books. And… he covers these more thoroughly than in his previous books. There are approximately 40 cameras covered. Tomosy couldn’t resist wasting several pages repeating basic repair stuff from his previous books. Are these meant as tempting commercials? I would have preferred he cover a few more cameras. A delightful book by a delightful writer. Matanle writes as if he and the reader are sitting at the kitchen table drinking coffee and passing cameras back and forth. And the books pictures are as if Matanle is showing you a family album and saying, “Here is one of my daughter I took twenty years ago with the camera you are holding.” He shows you pictures not so much to impress you with a certain camera, or his personal photographic skill, but rather because…he likes the picture for what it means to him. Delightful. Not too many photo book writers would do that. Matanle reminds me of Carl Shipman (whose books are a delight to read too). The book is packed with tidbits about a cameras cost, history, reliability and shortcomings as well as its finer points. Matanle is very opinionated in his likes and dislikes, as a writer should be. I find myself not always agreeing with him fully about certain cameras (like the Pen F series) but always seeing his point. He covers a wide variety of cameras and gives many lists of lenses. It is a very comprehensive book. Well worth the money! Those of you who have read some of my other book reviews know how much I like to complain. And yes, as much as I liked and enjoyed this book there is a complaint. Although the paper is very thick and of high quality, both my Matanle books (published by Thames & Hudson) are coming loose at the spine. They have only been read through once and thumbed through a few times since given to me last Father’s Day, only couple months ago. Both mine are paperback, hopefully the hardback versions are better. Just once in a while, one sees in a crowd a photographer who stands out from the mass of camera enthusiasts who rush to seize imagined decisive moments with their motor drives and zoom lenses. He uses a separate hand-held exposure meter and takes his time. His camera does not make a repetitive noise like a duchess sneezing, nor clatter like a distant scrapyard when the shutter is fired. A discreet click is the only evidence of his having recorded the world about him on film. This book is not a repair tome as most of the other books on this webpage, although the author gives many tips on reliability and possible faults in several old cameras. And tells the reader which ones are more likely to be dependable users. Rather it is a book to introduce one to the existential pleasures of classic camera photography. Matanle, an avid photographer, has peopled this delightful book, at the end of each chapter, with many pictures of his family and friends. A mood of compassionate familiarity is set by these examples. All taken with the very cameras described in that chapter. Within each chapter there is a plethora of professionally taken photos of the cameras, 320 Illustrations in total. Most books on classic cameras are dull lists of specifications and time lines. Not so here, here you will find descriptions of the form and feel of the cameras, the author’s personal likes and dislikes. Their idiosyncrasies and histories come alive in the many marquee comparisons. Oh yeah, there is a four page list of cameras at the end of the book for those who must have one. Also small lists of lenses, etc. are scattered here and there, but they aren’t often enough to put one to sleep. Shutter speeds and aperture sizes are interwoven into each cameras story. There are too many makes and models of cameras described to even think of completely listing here. But suffice it to say he describes a LOT of cameras. Entire chapters are spent on Leica, Contax, Rolleiflex, but even in these chapters he thinks to compare marquee’s. Though many classics, like Canon’s Canonet series, I would have liked shown and compared weren’t. Perhaps because the author lives in England where a whole different range of cameras were available. He did describe several I had never heard of. Or perhaps the limited space available, regardless it is a very fine book and well worth owning. My only complaint with this book (published by Thames & Hudson) is the same one I made of Matanle’s SLR book. The spine is coming undone even with the single complete reading and a few thumbings from the two months I’ve owned it. Perhaps the hardback versions are sturdier? I have 25 year old paperback Carl Shipman photo books (HPBooks) that have been handled many more times that are holding up better. Wonderful beat ! I wish to apprentice at the same time as you amend your website, how can i subscribe for a blog site?